This website will display the millions of books available to order from us online. It does not necessarily represent the current inventory at our physical store. If you'd like to know if a particular title is on hand at our store, please call us. Thank you! "Can you imagine a world without fish? It's not as crazy as it sounds. But if we keep doing things the way we've been doing things, fish could become extinct within fifty years. So let's change the way we do things!" World Without Fish is the uniquely illustrated narrative nonfiction account—for kids—of what is happening to the world’s oceans and what they can do about it. 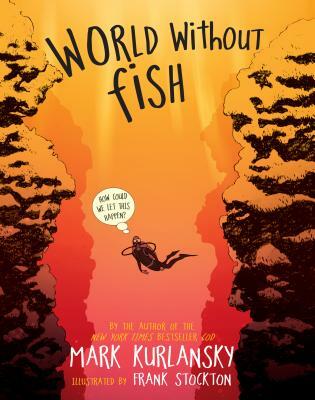 Written by Mark Kurlansky, author of Cod, Salt, The Big Oyster, and many other books, World Without Fish has been praised as “urgent” (Publishers Weekly) and “a wonderfully fast-paced and engaging primer on the key questions surrounding fish and the sea” (Paul Greenberg, author of Four Fish). It has also been included in the New York State Expeditionary Learning English Language Arts Curriculum. Written by a master storyteller, World Without Fish connects all the dots—biology, economics, evolution, politics, climate, history, culture, food, and nutrition—in a way that kids can really understand. It describes how the fish we most commonly eat, including tuna, salmon, cod, swordfish—even anchovies— could disappear within fifty years, and the domino effect it would have: the oceans teeming with jellyfish and turning pinkish orange from algal blooms, the seabirds disappearing, then reptiles, then mammals. It describes the back-and-forth dynamic of fishermen, who are the original environmentalists, and scientists, who not that long ago considered fish an endless resource. It explains why fish farming is not the answer—and why sustainable fishing is, and how to help return the oceans to their natural ecological balance. Interwoven with the book is a twelve-page graphic novel. Each beautifully illustrated chapter opener links to the next to form a larger fictional story that perfectly complements the text. Mark Kurlansky is a former commercial fisherman and New York Times bestselling author of Cod, Salt, The Big Oyster, and other books. He’s won numerous awards, including the James A. Beard Award, ALA Notable Book Award, and New York Public Library Best Books of the Year Award. He lives with his wife and daughter in New York City and Gloucester, Massachusetts. His website is www.markkurlansky.com. Frank Stockton is an artist and illustrator whose work has appeared in Esquire, The New Yorker, The New York Times, and Rolling Stone. He lives in Brooklyn, New York.